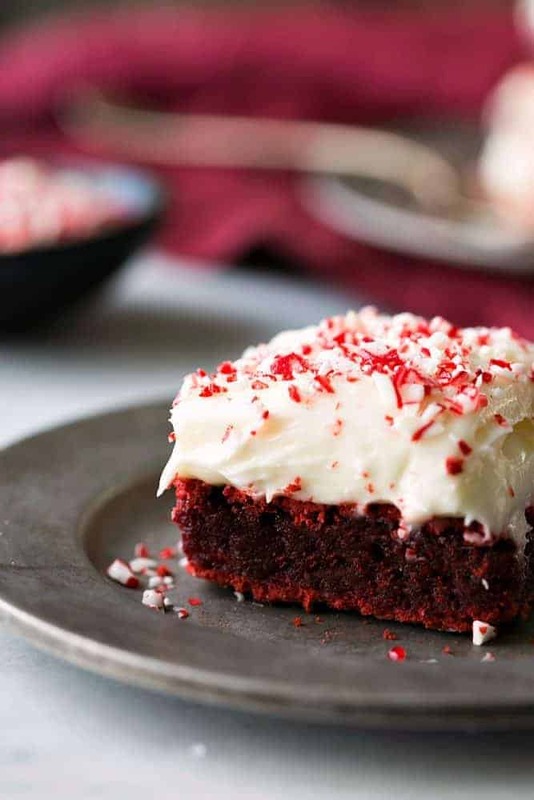 Red Velvet Peppermint Brownies with Peppermint Cream Cheese Frosting are the perfect holiday brownie! 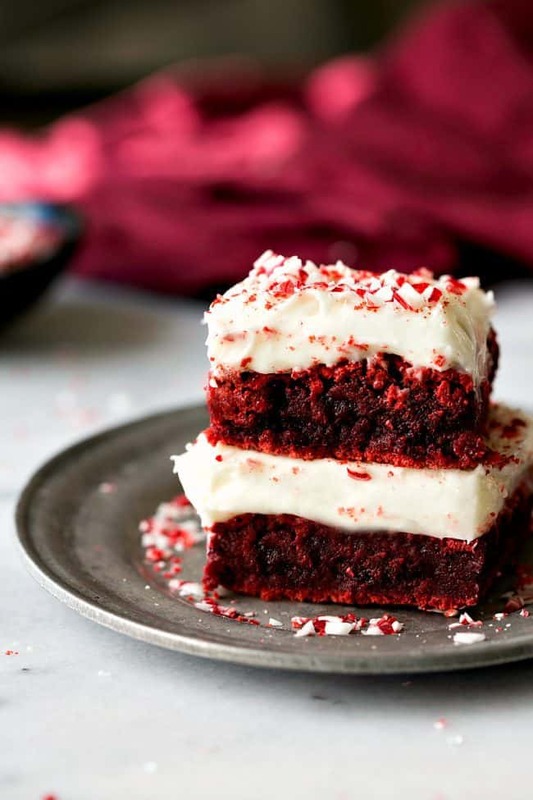 A rich and chewy vibrant red peppermint brownie piled high with peppermint cream cheese frosting. The holidays are finally here! Can you believe it? I have already been baking up a storm. I look forward to the flavors that fill my house while I am baking this time of year. There is no better time to savor the flavors like warm cinnamon, savory thyme, or cool peppermint. I always use McCormick and their quality spices, herbs, and extracts in my cooking and baking. But we recently got to put their products to the test during a Google hangout with McCormick Chef Kevan Vetter. We were given cinnamon, thyme, and peppermint to compare to another brand. We couldn’t tell from the packaging which was McCormick and were able to taste both and compare. We were able to tell which product was McCormick every time! And quite honestly I was blown away by the difference in quality. McCormick had a different, stronger scent and a bold taste. We were then given some peppermint bark made with peppermint extract. Both were in generic packaging and we were supposed to taste and decide which one used McCormick peppermint extract. The first one that I tried tasted more like the white chocolate than the peppermint flavor. The second one left that peppermint flavor in your mouth and was perfect. It had the perfect balance of peppermint and really came through in the white chocolate. You could immediately tell that that was made with McCormick peppermint extract. The peppermint flavor is undeniable! 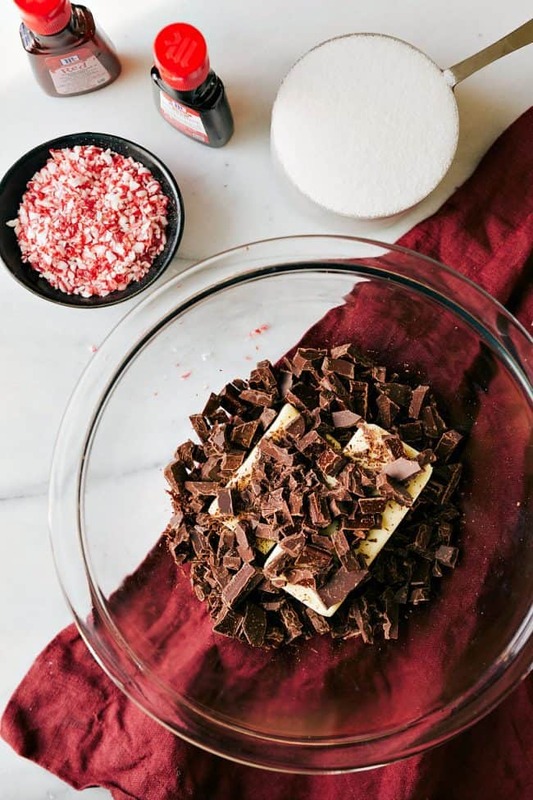 I had to share a recipe with you today that used peppermint extract. If you aren’t already using McCormick peppermint extract you need to try the difference! It is exactly how you would think your holiday peppermint goodies should taste. 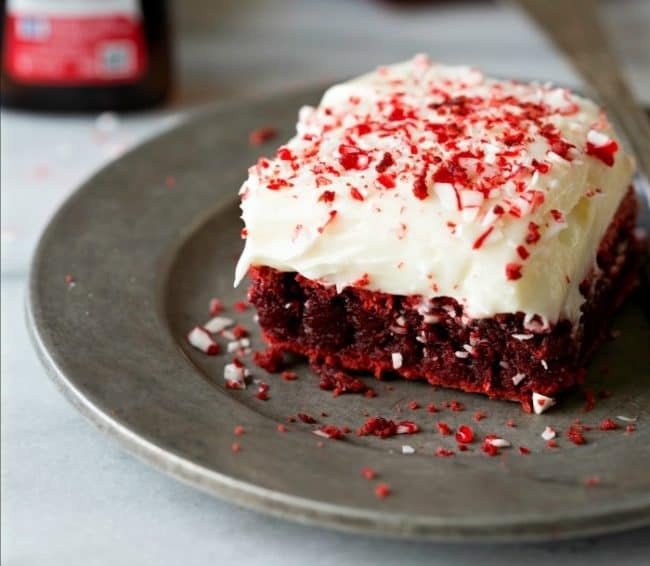 These Red Velvet Brownies are the absolute perfect holiday brownie. You guys. This brownie. Is hands down the very best brownie that you will make. 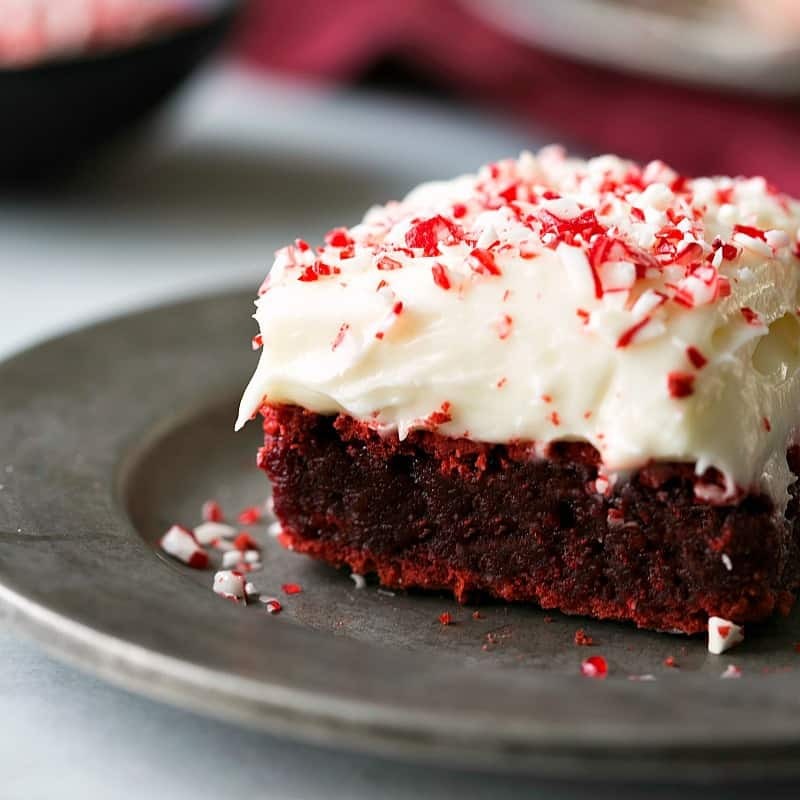 It is perfectly chewy and moist with that peppermint flavor that comes through. They bake perfectly! These brownies are a must make for your holiday baking! In a microwave safe bowl melt the chocolate and butter stirring after 30 seconds each time being careful not to burn the chocolate. Whisk in the sugar and add the eggs one at a time until blended. 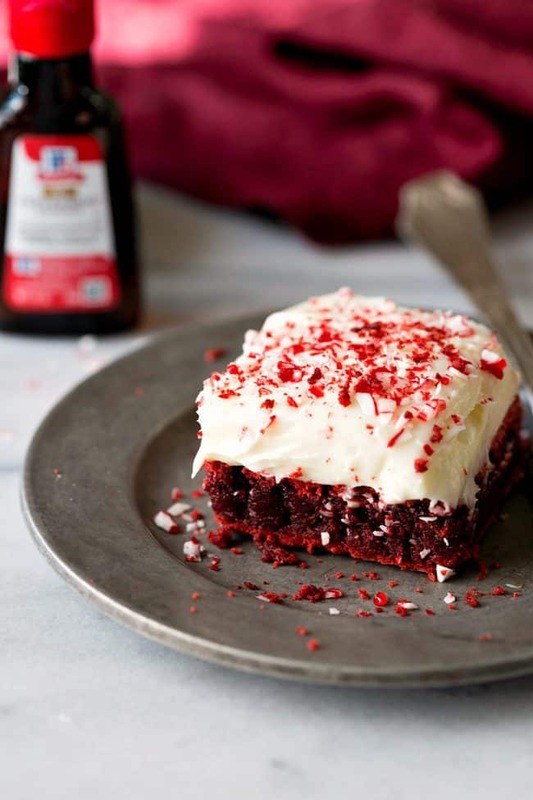 Add the flour, red food coloring, baking powder, vanilla, and peppermint extract. Stir until fully incorporated. TO make the cream cheese frosting: Beat together the cream cheese and butter until smooth. Add the powdered sugar, vanilla, and peppermint extract and continue to beat until creamy. Frost the cooled brownies. Top with crushed candy canes. I LOVE McCormick extracts!!! Delicious! 1) Absolutely in love with your presentation of the brownie. I can feel the crunchiness of the candy cane just by looking at the picture. Mouth = salivating!! 2) I didn’t see the candy cane in the ingredients, is that not part of the recipe? Or did I miss something? I think it’s a nice touch, and I definitely see why would add a nice contrast to the chewy brownie. Can’t wait to make this, honestly. They are amazing! I hope that you try them! The brownies just get topped with crushed candy canes. I think it was a good touch also, already made it for my family, and they loved it so much!???? I’m so happy I finally found a dessert that I like. These look fantastic! Is there any way to make them without peppermint, by chance? Uhhhhmazing!!!! Going to use this wonderful recipe for a class “How To…”. Thanks so much!!!! My brownies were hard crusted on top and sunk in the middle as they cooled, Plus the crust broke in a bunch of pieces when I cut them!!! What did I do wrong??? Hi Alyssa, I am going to make these for the holidays, would they be suitable to freeze? We love red velvet at our house!!! I want to try this version though! The crushed candy canes is a nice holiday touch!